My favorite non-denim pants? Probably a pair of vintage Christmas-y faux-patchwork from Brooks Brothers. The cut is objectively bad but they’re a hit at parties. I wear those once or twice a year. I wear suits a couple of times a month, and real, like, Die!-Workwear-approved trousers once or twice a week. Most work days you’ll find me in off-the-rack cotton khaki pants. The color range is narrow, from stone to putty to olive drab. Go-to-hell pants are great; bespoke pents are great; but I want my everyday pants to be great, too. So what are the best everyday pants? The overall winner was the J. 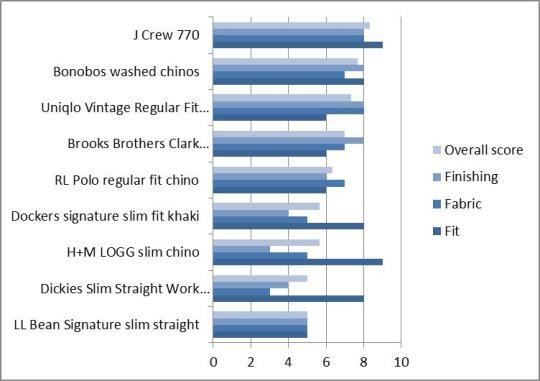 Crew 770 (formerly the “urban slim fit”). With a medium to low rise, significant taper, and few other frills, the J. Crew 770 is in my opinion the ideal, current casual office or weekend pant. Pros: I like the wider (military style) hem off the rack (although when possible, I get my khakis cuffed), the washed (but not wrinkle-free-treated) fabrics, and most of all, the fit–comfortable, sitting below the waist, but tapering to a relatively narrow hem (hem width, of course, varies by size–on a pair of 34 waist pants it’s about 8 inches across). Cons: The washed fabric wrinkles relatively easily and requires ironing for office appropriateness (only a problem if you’re lazy). At retail, they’re not a bargain, exactly, but when is J. Crew not on sale? I had heard a lot about Bonobos but never tried them out—nice pants! The fit was similar to J. Crew’s—a little slimmer in the waist, and slightly lower rise. If you want a higher rise pant, these are not them. Pros: The cut is flattering and the fabric, though lightweight, is not flimsy. The unique slide button fastener is interesting. Cons: None, really; they are on the higher price side of the scale here—once you get above $100 other options like Jack Donnelly or the more refined J. Press start to get interesting, although they require more cost in alterations. The Uniqlo pants have a beefier, starchier fabric than the higher-scoring pants, which come with a more broken-in feel. 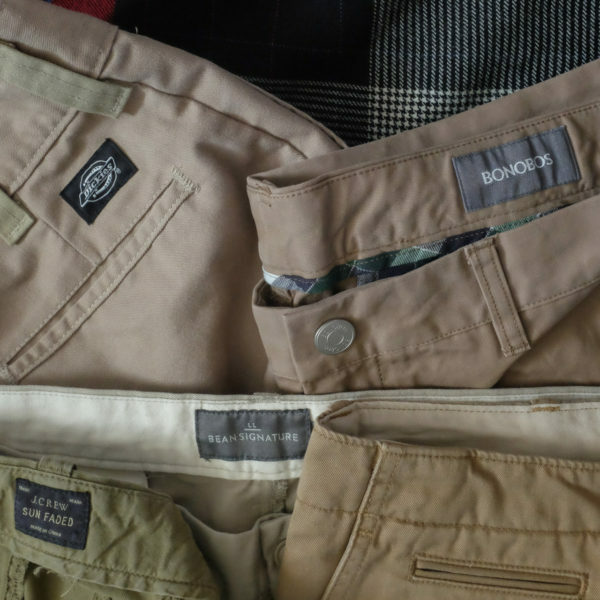 I owned a bunch of Uniqlo “vintage chinos” a few years ago when Uniqlo first appeared in the U.S.–the current version is missing the cool metal button the old ones had but the rise on the new vintage chino is higher and much more wearable. Pros: At $40, these are the best value on the list, for certain. Cons: Uniqlo’s stock is often low so finding your size can be tricky. I could only get these with longer inseams than I need, which will require alterations or rolling the cuffs. Brooks Brothers is the king of anonymous business casual, and these pants fit right in that tradition–they’re very unspecial, which can be a goo thing. The finishing is cleaner than many other pants on the list–stitching straight, seams covered. But they occupy a space between very traditional (J. Press) and modern (J. Crew) that just ends up sort of boring. 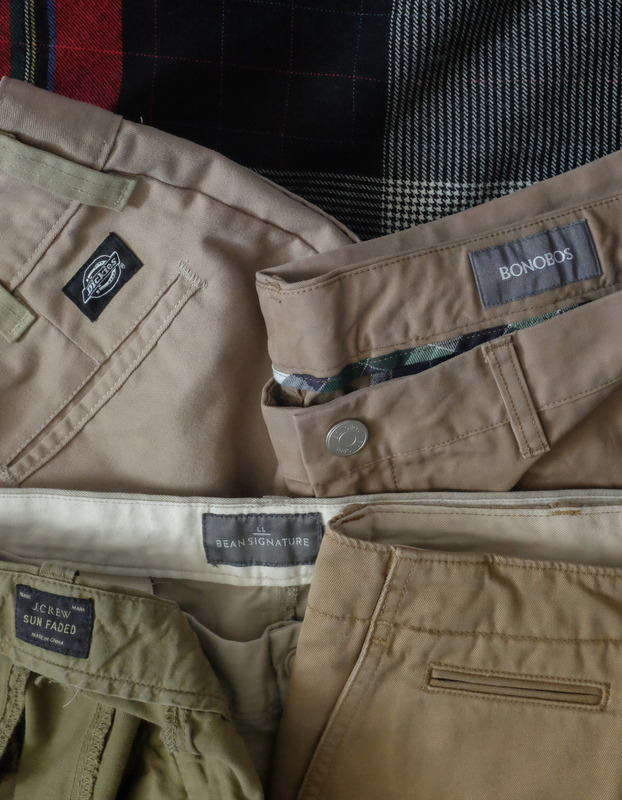 Cons: None of these pants have particularly helpful naming conventions, and Brooks’ is the worst. Clark? Hudson? Milano? Now I want a cookie. I have a fondness for Polo chinos, which reigned over Nautica and Tommy Hilfiger in my high school (khakis met the dress code). But the modern standard Polo chino is pretty similar to the Brooks Brothers version–OK but nothing special. Pros: I like the cotton twill Polo uses–reliable, soft, untreated but also not too washed. They’re also pretty clean internally and use oxford cloth pocket bags, but that’s sort of a who-cares detail to me. Cons: The cut is unflatteringly loose in the thigh. Not a con, per se, but note that the less youth-oriented brands tend to be more true to size–a 34 waist actually measures a little larger than 34 inches in Polo and Brooks, but significantly larger than 34 inches in J. Crew, for example. Dockers have so many cuts and finishes it’s hard to tell what’s what when shopping, but the model I tried on was the only one in my sample with a center crease ironed in–this gave them a clean, nicely tapered look. I didn’t love the fabric or finishing, though. Likewise, H+M’s L.O.G.G. chinos in slim (not skinny) fit were quite well-cut but the fabric was insubstantial and rough. They also come in only one length per waist size so may require alterations. Dickies’ slim straight work chinos are a little too raw for most offices–they’re a poly blend. A good choice when street cred is more important than refinement. I own and like some L.L. Bean Signature items, including a great pair of heavyweight cotton, broken twill field pants, but their current slim straight model, while fine, did not impress me.